C1018 Cold Finish Hexagon, is a rolled steel product with close dimensional accuracy, smooth surface finish, and increased mechanical properties and machinability. C1018 Cold Finish Hexagon is a general purpose low carbon steel with good case hardening qualities and is especially suited for cold forming and bending. 1018 Steel is the most commonly available of the cold-rolled steels. It has a good combination of all of the typical traits of steel - strength, some ductility, and comparative ease of machining. Chemically, it is very similar to A36 Hot Rolled steel, but the cold rolling process creates a better surface finish and better properties. 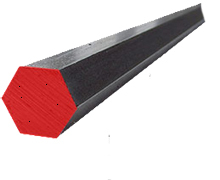 1018 Steel is the most commonly available of the cold-rolled steels. It has a good combination of all of the typical traits of steel - strength, some ductility, and comparative ease of machining. Chemically, it is very similar to A36 Hot Rolled steel, but the cold rolling process creates a better surface finish and better properties. Characteristics: Oiled surface, smooth dark grey finish. Sharp or defined edges. Accurate dimensions throughout length. Workability: Easy to Weld, Cut, Form and Machine, Excellent candidate for most processing techniques. 1018 Steel is the most commonly available of the cold-rolled steels. It has a good combination of all of the typical traits of steel - strength, some ductility, and comparative ease of machining. Chemically, it is very similar to A36 Hot Rolled steel, but the cold rolling process creates a better surface finish and better properties.